Click here to sign up for any available Help Desk shift if you are an attorney. Click here if you are a student. If you are interested in accepting an open case, click here. Our mission is to improve access to justice through pro bono legal work. Our program exists to help attorneys make a difference in Greater Birmingham. 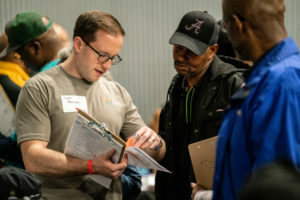 An opportunity to volunteer speaks to the primary factor that led us all to choose the profession of law: serving the people of our community by helping them obtain justice. By volunteering with us, you are joining a large corps of volunteers coordinated by a professional staff driven to improve access to justice. We are relentless in our pursuit of justice for low-income people facing pervasive civil legal problems. We are steadfast in our belief that willing lawyers are capable of learning how to navigate the justice system on behalf of low-income clients. Our program is organized to make volunteering easy. Attorneys can spend as little as 2 hours at a weekday morning Help Desk, agree to full representation of a client, or something in between. 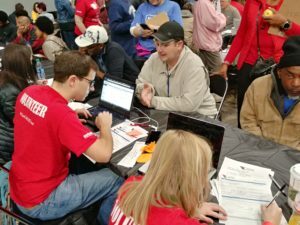 Volunteer attorneys do not need expertise in a specific area of the law. We provide the training you need: we have forms, pleadings, and how-to guides; and our staff attorneys are available for questions and guidance at any time. Volunteering provides an opportunity to work closely with clients seriously in need of your help and to help resolve issues in innovative ways that benefit the whole community. 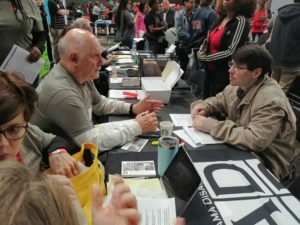 Many of our volunteers appreciate this opportunity both for a one-on-one client relationship and for professional experience in a courthouse, in front of a judge. Outcomes can be quick and meaningful in many cases. If you would like to volunteer at a Help Desk, click here. To view our currently open cases, click here. What kinds of pro bono cases are available? In order to better meet the most pressing legal needs of our clients, we have focused our work on addressing the four areas below, which can present life-altering challenges for low-income people. What happens after I agree to take a case? VLB Staff Attorneys can help facilitate full representation and will provide resources and assistance throughout the case if needed. You are covered through the VLB malpractice insurance when you accept a case through us. Clients may qualify for court costs to be waived by filing an Affidavit of Substantial Hardship. VLB attorneys can provide you with this form, which clients fill out with their detailed financial information. Clients may need your assistance understanding everything on this form. After client completes the affidavit, it must be notarized before filing. VLB Staff Attorneys Katrina Brown and Kintisha Matthews can provide notary service at no cost. Other litigation costs are the responsibility of the client. If the client cannot pay for litigation costs, please contact VLB. What role do volunteers serve at Help Desks? Time: Your Help Desk shift is for 2 hours. You will meet with 1 to 3 clients per shift, depending on client needs that day. Space: You will have a semi-private, quiet place to meet one-on-one with your client. 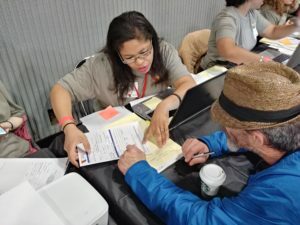 What should I expect when I arrive at a Help Desk to volunteer? Upon arrival, please check in with the VLB Attorney at the Help Desk. The VLB Attorney will match you with a client who has completed intake and will provide you with a packet containing an Information Sheet completed by the client, an Intake Sheet completed by VLB staff, and a form for you to use to take notes. What should I bring when volunteering at a Help Desk? Very little. You do not need your laptop/tablet or other supplies, beyond a pen and legal pad. VLB provides all of the materials and forms you will need, including our specific form for you to take notes about your client meeting then provide to the VLB Attorney. VLB has arranged Alacourt access you may use. Several courthouses where we work, especially domestic relations, are chilly. Consider bringing a jacket or sweater. Feel free to bring along your morning coffee or a bottle of water. We want you to be comfortable. Can you tell me about the clients I will see at the Help Desk? Many clients are dealing with the worst crisis of their lives. They may be angry and emotional; some clients are victims of ongoing abuse; others are homeless or facing homelessness. They might be intimidated by courthouses. They may have just gotten off their night shift job, taken an unpaid day of leave to make it to a Help Desk, or had to beg a neighbor for a ride because they don’t have a car. Yet they are often very relieved to just speak with a lawyer. You are the face of hope. It is important to remember that our clients do not know legal terms or deadlines, and often don’t understand the language in the forms needed to get their cases started. Therefore, you might need to walk them through legal forms and explain legal language in very plain terms. You also might need to emphasize the documents often required by required by the court system and prepare clients to collect these documents for their next visit, such as: pay stubs, letters from creditors, divorce orders, contracts, leases or mortgage papers.